Free Music Man Download from FilesPack.com! Enjoy the easy way to rip, convert, burn and play with this digital music software for Mac OS X. 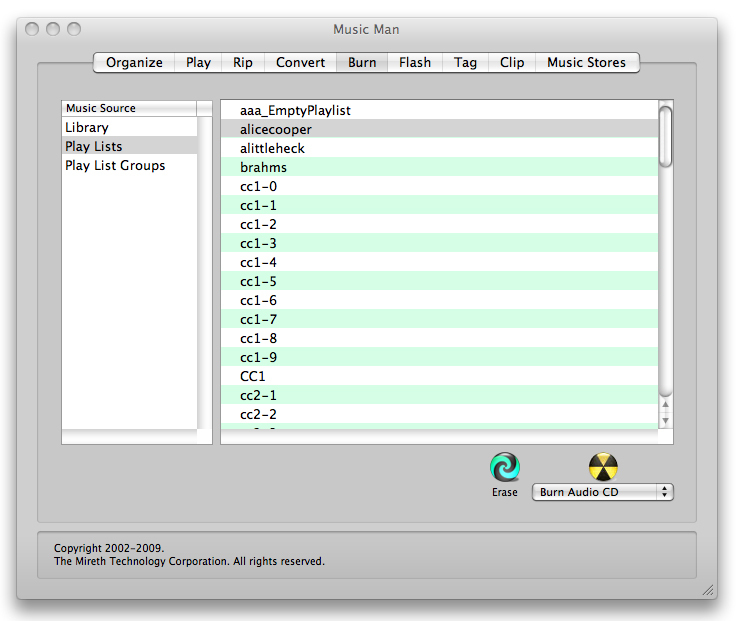 Music Man includes all the features you need from a MP3, WMA, WAV, M4A, Ogg Vorbis Converter, Ripper, Burner, Player. Rip from Audio CD. Convert most formats - Audio CD, AIFF, MP3, unprotected WMA, WAV, AAC(M4A) and Ogg Vorbis formats. Burn to Audio CD, MP3 CD, DVD or to USB Flash Drive. Burn an MP3 CD and get 10 hours of music on 1 CD, 50 hours on an MP3 DVD. Using variable burn quality, get 1 to 4 hours of busic on a 64mb USB Flash Drive. Play music files, CDs and directly from USB Flash Player. Get the features you want - easy to use, easy navigation of all disks to locate music files, store play lists to easily burn another copy of the CD. You can free download Music Man 1.8 now.